Tennis Clubs and BSC (Balanced Scorecard) might seem unconnected on first interaction but when it comes to performance measurement and management, the connection immediately emerges. One can look after the improvement of the club by measuring the steps the management makes in various directions. The multi- directional approach promoted by BSC is its strength. In case of Tennis Clubs, these areas can be- Infrastructure, Maintenance and Compliance, Process and Improvement. Infrastructure can be evaluated using KPIs like 'Type of courts', 'Number of Courts', 'Lightning aspect- and 'Equipment Quality'. Process Perspective can be measured using indicators like 'Training Sessions' Duration', 'Number of Tournaments', 'Number of Coaches' and 'Technical Competence'. Maintenance and Compliance Perspective can be obtained using metrics such as 'Rolling Frequency', 'Synthetic Court Brooming Frequency', 'Claying Frequency' and 'Guideline Compliance index'. Finally, improvement can be gauged using parameters such as 'Percentage increase in participation', 'Number of successful professionals emerging', 'Decline in 'non-availability' of court' and 'Revenue Generation rise'. Why not measure types and number of courts, as well as equipment quality? Measuring customers is also helpful. Thus, it's recommended to evaluate such measures as existing vs new customers ratio as well as profitability of each target customer group. Success is also measures through number of professionals emerging in the club, as well as celebrities and VIP customers. 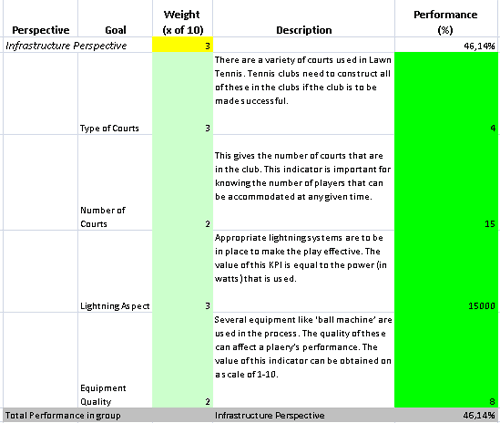 Download trial version of Tennis Club Performance Indicators. Purchase full version of Tennis Club Performance Indicators + bonus. Tennis Clubs are places visited by people who are either interested in playing the tennis game themselves or watching others play. There can be a large variety of courts that a given Tennis Club houses. The quality of game played gets affected tremendously by the state in which courts are maintained. This is to say that the management group of the tennis club has to make sure that courts are well- maintained and organized. Moving on, several other ancillary services are also provided by the tennis game service providers. Therefore, a tool to keep an eye on the direction in which operations are heading is to be put to use. This can be done by introducing BSC (Balanced Scorecard) in the organization. The prospective user is required to identify the useful set of indicators for 'evaluation purpose' and use the values to make sure that things are well within control. On the whole, by preparing a Tennis Club scorecard, one can hand over the 'management anxieties' to some extent to this tool and pay heed to more important issues. This will help in better utilization of resources and drawing maximum returns from them in the field of Tennis. Related metrics and KPIs for: Ski Resort, Sport Gym, Golf Club, Yacht and Sailing Club, Swimming Pool. Customers who viewed this item also viewed: CRM Metrics. This is the actual scorecard with Tennis Club Performance Indicators and performance indicators. The performance indicators include: infrastructure perspective, type of courts, number of courts, lightning aspect, equipment quality, process perspective, training sessions duration, number of tournaments, number of coaches, technical competence, maintenance and compliance perspective, rolling frequency, synthetic court brooming frequency, claying frequency, guideline compliance index, improvement gauging, percentage increase in participation, number of successful professionals emerging, decline in non-availability of court, revenue generation rise. Download a trial version of Tennis Club Evaluation Balanced Scoreboard or purchase a full version online. All articles about measuring performance in Leisure and Recreation.